When we first moved to Seattle, I bought Dexter a Seattle Seahawks baseball cap. It was the cutest little hat. I, of course, posted a picture of him wearing it on Facebook, because something that cute needs to be shared. My father-in-law, a die hard Michigan fan, of course jumped my case telling me his grandson couldn't be seen wearing a Seahawks hat. My retort was, "I didn't know you liked baseball." You can imagine his total HORROR with me when I said that. He then informed me that the Seahawks were not a baseball team, but a football team. My answer to that was, "Well, then why is it on a BASEBALL cap?" Anyway, since then, I have been well informed on sports teams and team names in Seattle. Last February when the Seahawks went to the Superbowl, the crazy amount of team spirit filled our city. Buildings hung huge 12s from the sides and lights were changed from plain white to blue and green. Seahawks gear was sold out everywhere and you could tell why, everyone you walked by was wearing something Hawks related. 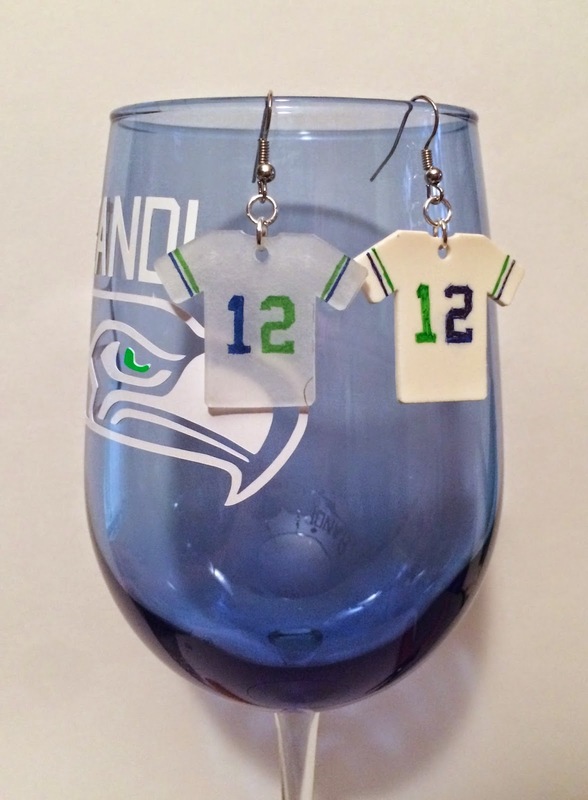 Heck, I even fell into the spirit and bought the kids shirts and made necklaces and earrings to support our team. It was hard not to catch the fever. So with football season just around the corner, I knew I needed to start early on supporting our team. For months now, I have been playing around with shrinky dinks, you know that plastic that you color and make fun shapes and then put them in the oven and they shrink down to like 60% of their original size? Well, I've been not only playing with it to make my own fun things, but I have figured out a way to use shrinky dink materials in my Silhouette. The settings on your machine should be 9 for blade depth and I also did a double cut on it. It still doesn't cut all the way through, BUT it cuts almost all the way through and shrinky dink plastic is thin enough that you can carefully pop it out. Yea you heard me correctly...I put shrinky dink sheets in my Silhouette and make charms and shapes to use as necklace charms and key chains. Did I just blow your mind? I hope so, because I have been working on this for months and when I finally got the perfect combination it blew my mind. 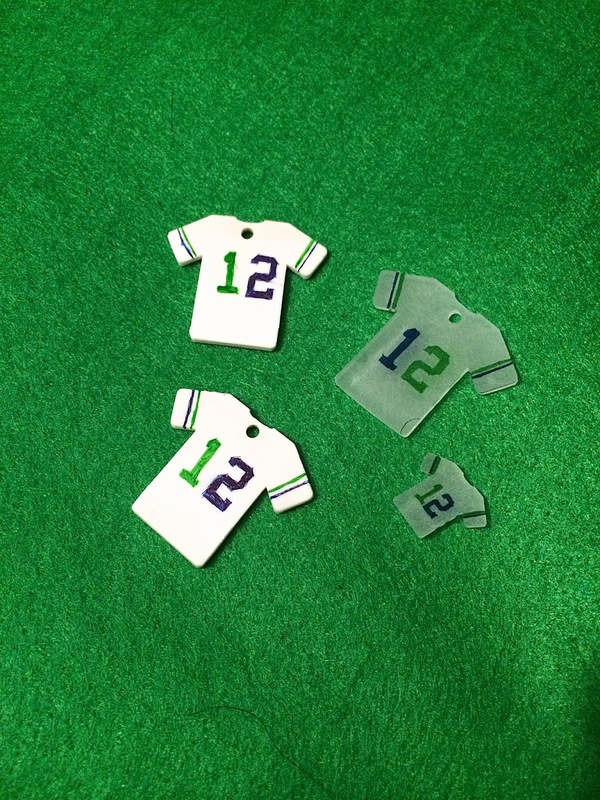 In the case of these super cool Seahawks charms, I found a picture of a shirt and traced it. Then I made it into a few different sizes because I wasn't sure what size I wanted my final product to be. 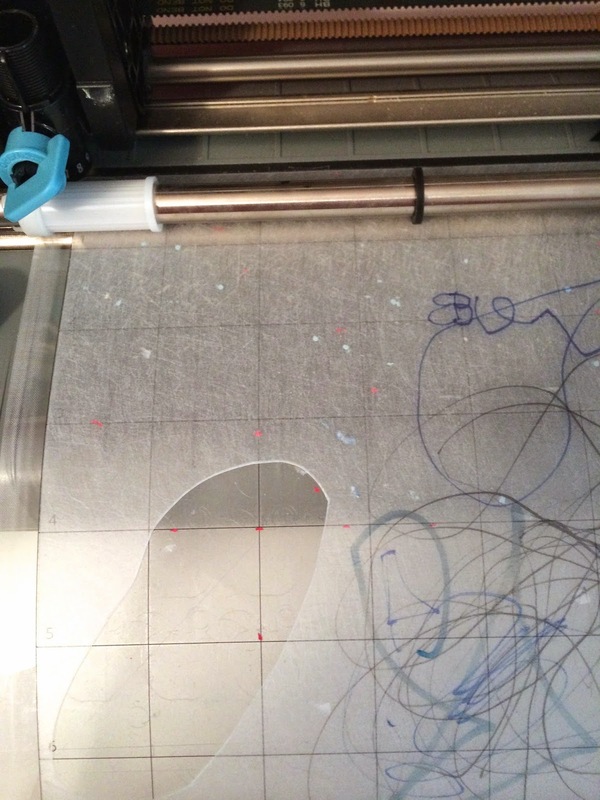 I also tried running the shrinky dink material through my printer so that I could just do a print and cut, but I was having difficulties getting my printer to like the size of my shrinky dink sheets. 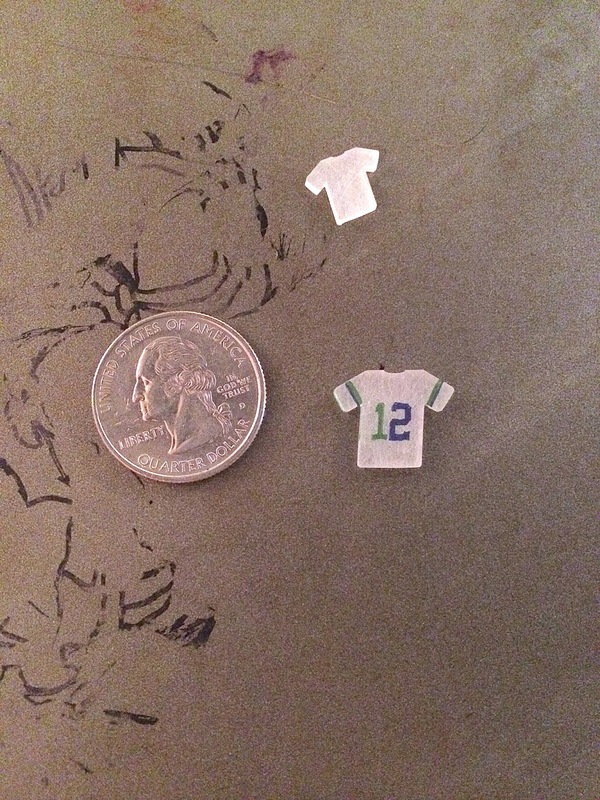 Instead I ended up just tracing a 12 onto the shrinky dink paper and coloring them in with a sharpie. I tried using a white sheet and the frosted and I have decided that using the frosted is not only more appealing as you all told me on Facebook, but it's also easier to use, meaning the sharpies work better on the rough side of the frosted sheets. So, once I had my shirts cut out, I colored 12s on them and then put them in the oven. Even as an adult I find the act of watching shrinky dinks in the oven to be so much fun! Watch it, you'll agree! Anyway, when they were all done, I used two jump hooks each and put on a fishhook earring and TADA! awesomeness! Of course you could do this with any football team but really, why would you? Which ones do you like more? The frosted or the white? To make your own shrinky dink earrings, you can download this free shape! 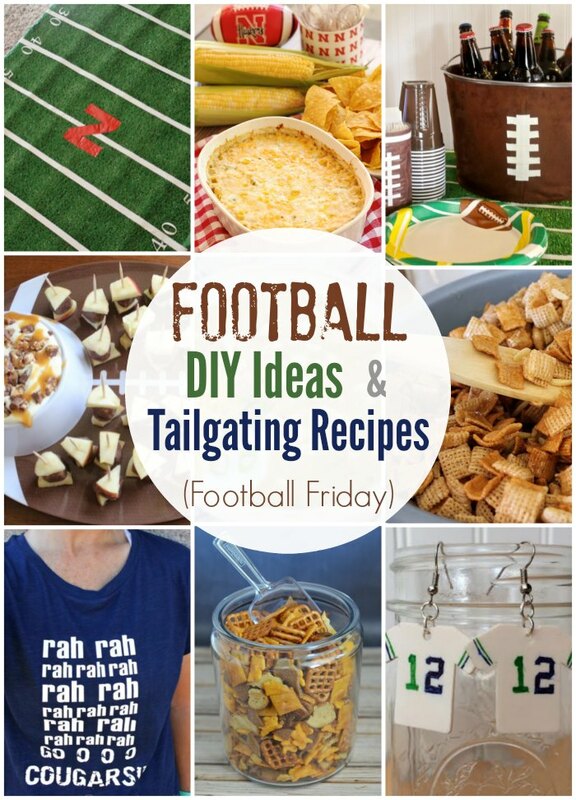 Need more football ideas for your game-watching and tailgating this weekend? I've teamed up with a group of other creative bloggers to share some fun football game day ideas! 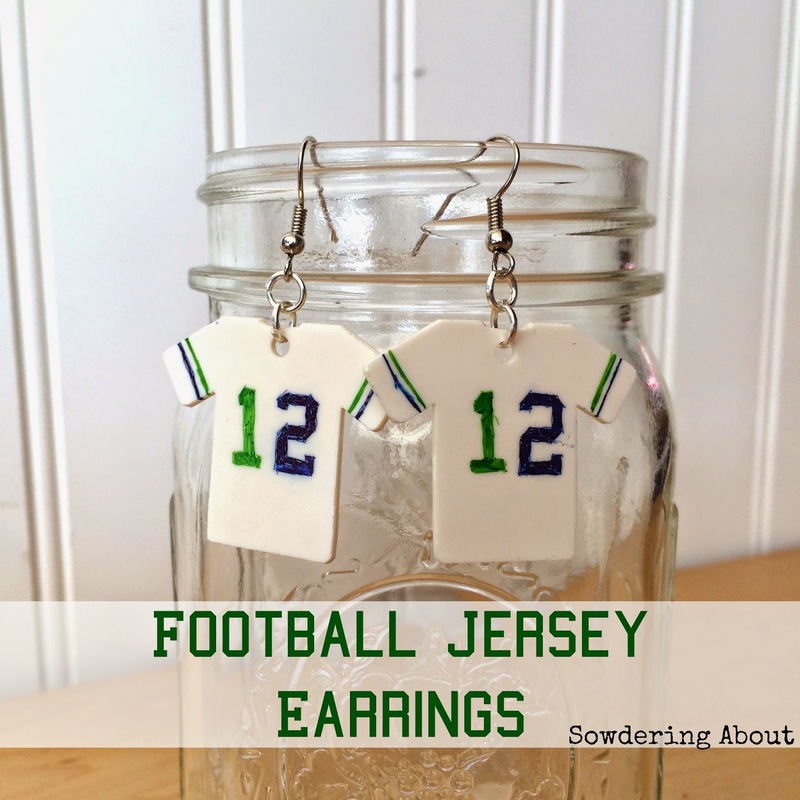 The list includes some awesome DIY football wear, game day decor, and tailgating recipes! DIY Football Field Table Cover Be sure to pin this list and then click around to see all the other 10 football fun posts! Shinky Dinks! How fun I haven't used those for 20 years. I like the white better. Although I'm not a football fan, your craft did get my wheels turning for some other ideas! Hahahaha! That is a great story about the "baseball" cap! We lived in Seattle for about 9 months when my kids were little and loved every minute of it. My husband has always been a Seahawks fan because they are pretty much the only team in the Pacific NW (He's from Oregon). He almost died when my daughter called them the Seagulls last night. Lol. Thanks for joining in the Football Friday fun! OK...so I am not the only one who knows about shrinky dinks? I have a bracelet that someone gave me and when I try to explain people stare at me with glazed over eyes! Thanks for the free shape btw that makes it so much easier. I pinned your football board too. 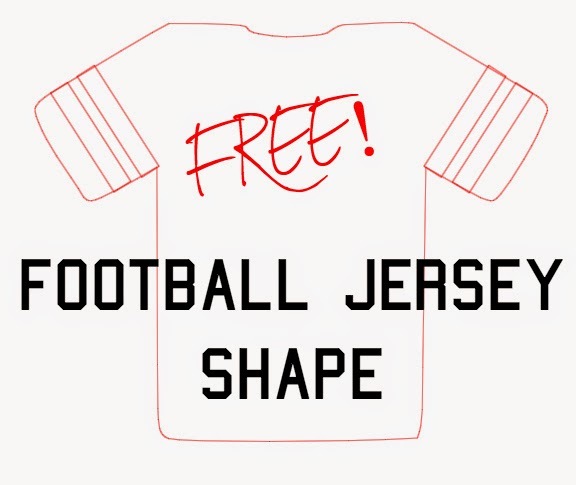 Drop by the blog - I've done a Football Friday series for college - and I have a football pinterest board (AnyGirlCanDoIt). I am so excited that football is here! Love these!!! I am about to post my 3rd post to a football series "Friday Night Lights Series" on my blog. My oldest plays high school football and so I decided to do weekly posts on spirit related things. I am totally sharing this on Facebook. I have read where the silhouette won't cut the shrinky dink material. What settings did you use? Where did you get the Shrinky Dink material? Love it! These are terrific! What did you put in as your material type? How creative! These are adorable. These are so cute! I think I like the see through one better than the white. So fun! 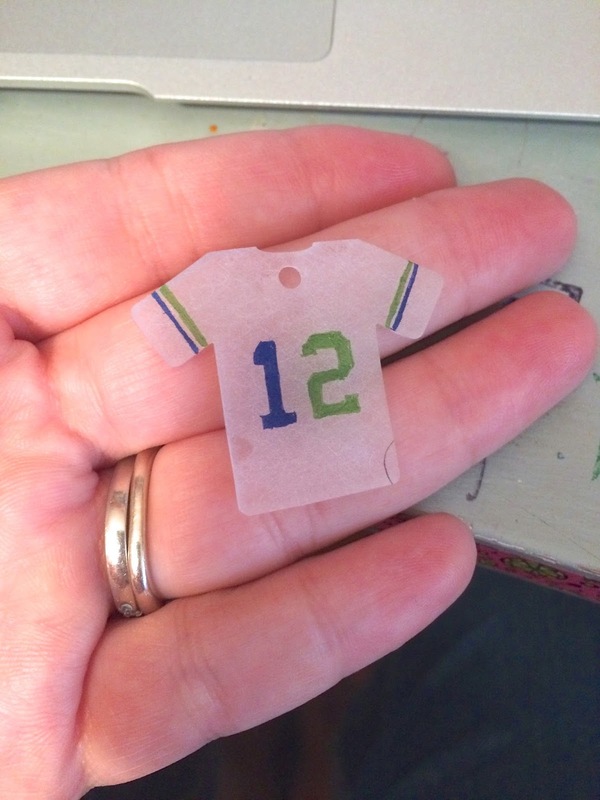 I haven't used shrinky dinks since I was a kid! Love these! Thanks for joining in our Football Friday fun! What a great idea! Love football! Thanks for sharing with us at Pin Worthy Wednesday!